My Wandering Life: Merry Christmas from Shanghai! It's our third Christmas in Shanghai, which seems like forever for us! 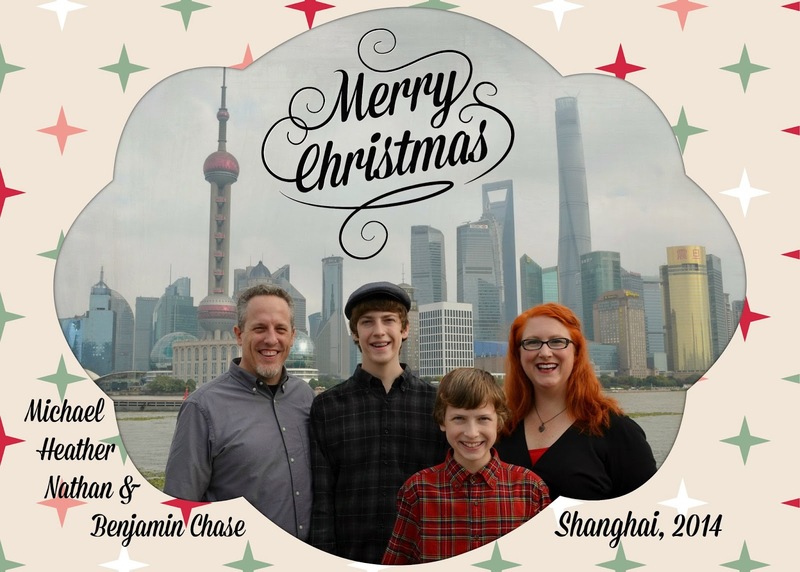 To mark the milestone, we decided to actually feature Shanghai on our annual Christmas card. We just wanted to make sure we were sticking around a bit before we committed... heh heh heh. We live just out of the frame on the far right hand side of the photo, in the shadow of the second tallest building in the world, and the first and second tallest buildings in China. I do love this city so much! You'll note that Nathan has now surpassed Michael in height, which officially makes him the tallest member of his family, on both sides. Ben is trying desperately to catch up. This morning Michael and I slowly woke up and made our way to the living room to find the boys around the tree. We asked if they wanted to eat breakfast or open gifts first. You can tell they are teenage boys (or almost in Ben's case) because food came first. Lucy Rocket wants to wish you a very merry Christmas too! All she wants for Christmas is you! Or more specifically, your lap to sit upon! This year the boys really, really wanted a Sony PlayStation 4 for Christmas. The only video game system we have is a hand-me-down Wii, which was old when we got it 5+ years ago. We dragged our feet for months on whether to get the PlayStation or not... it's not cheap. This past weekend we still hadn't made a decision, though we did decide to bless some other people who have had rough years this year with surprises to make their Christmases a little more merry. On Monday, Michael walked into his office and on his desk was a Sony PlayStation 3 and Guitar Hero and some games, all left there by his boss who had decided to give them to our boys. I know these two things are related... no one ever became poor by giving! The boys were still over the moon excited about the 3, and we were able to go to our local grey market and pick up some fun games for cheap. We're off to celebrate Christmas dinner Kiwi-style with our friends from New Zealand. I hear it's all meats and desserts, so both Michael and I will be very, very happy! Hope you have an excellent Christmas, filled with warm moments and lots of opportunities for making good memories! My little Benson was thrilled to see your picture at the top of this post. He went and got the real copy off of our picture wall, brought it to me and said, "These are our friends!" I love that. Because although Michael is the only one I've ever met in real life, I feel like you and I are connected as well. And all of my kids love hearing about your family and life over there. Happy 2015, Chase family!